The months after Winter are pretty rough on my skin. After having kids my skin has drastically changed and it feels like it's getting more dry every day. Regular moisturizers just aren't doing the job anymore so I've been in search of something a little stronger to get the job done. I'm trying to stay away from Botox and other fillers and stick with more natural ingredients, instead of injecting chemicals in my face. 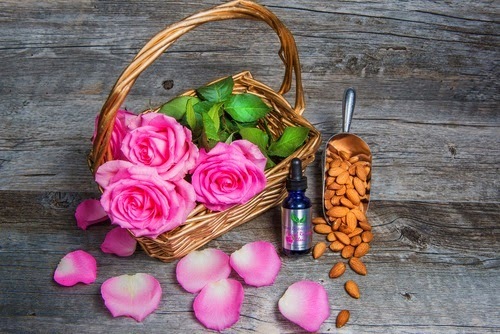 What I've found while doing some research, is that it's safer and much more effective to use all natural beauty products. So many things we put on our hands and face are full of chemicals, using makeup and skincare that is all natural is a safer way to keep skin healthy and younger looking. I also found that serums are more more effective in treating skin problems compared to plain old day and night creams. I wouldn't recommend serums for greasy skin , since serums are already a tad bit oily you wouldn't want to apply more oil, but for dry skin and enlarged pores one of my new favorites is Nature Beautanicals Facial Recovery Blend. 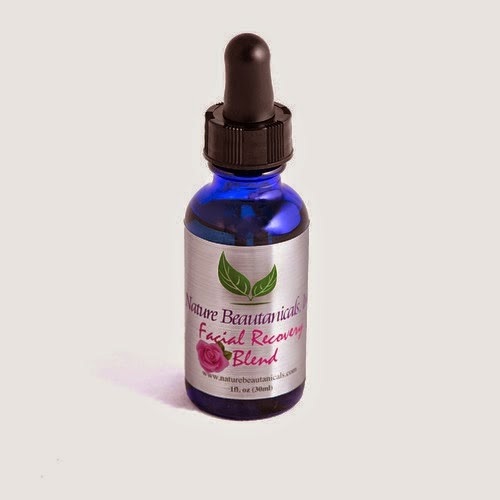 The Facial Recovery Blend ($29.99) is a 1 fluid ounce bottle that comes with a small dropper and is 100% natural. It soothes large pores and sun damaged skin. As I'm getting older I notice one of my issues is sun spots. Like many others my age I grew up in the age of tanning beds and unfortunately spending way too much time in a tanning bed is now costing me and my skin. I hope younger people are reading this and backing away from tanning and getting more into protecting their skin. But for everyone else it's not too late. The Facial Recovery Blend is a blend of ingredients that together refresh and rejuvenate your sun damaged skin. I can only compare this to another product, Dr Dennis Gross Retinol Brightening Solution. This is meant to brighten your skin and pretty much does everything that "Nature in a Bottle" does except the price tag is much higher. Dr Dennis Gross' product retails for about $85 dollar. Big difference!!! I highly recommend anyone that has sun damaged dry skin to try out Nature In A Bottle's "Recovery Blend". I think for the price tag you are getting a great deal. If you are interested but unsure if you want to purchase the entire bottle, visit their website and you can sign up for a free sample size. Disclosure: A press sample was sent for consideration from PR for the purpose of this review. All opinions are my own. lately i've been using lots of natural skin care prodcuts and i feel a huge change in my face. thanks for sharing this, i'm going to sign up to receive my sample.